Jessie Cornelius Graham was born in Searcy County, Arkansas on 22 July 1892. By my reckoning, he was the second child of John Henry Graham and his wife Mary Matilda (Bohannon), and their first son. He was likely named for both of his grandfathers, paternal Jesse Graham and maternal William Cornelius Bohannon. Jessie, age 8, was recorded on the 1900 census living with his parents, two brothers and two sisters, in Red River Township. The middle initial C was recorded here. The 1910 census recorded Jessie, age 17 and this time without the C, still living with his parents and then seven siblings in Red River Township. It was recorded that two of his siblings had died, but without their names. On 5 January 1917, Jessie signed as security when his younger brother John Jasper paid a $100 bond for a license to marry Miss Danner Copeland. On this bond he signed his first name as "Jesse". On 5 June 1917, Jessie registered for the draft for the Great War. 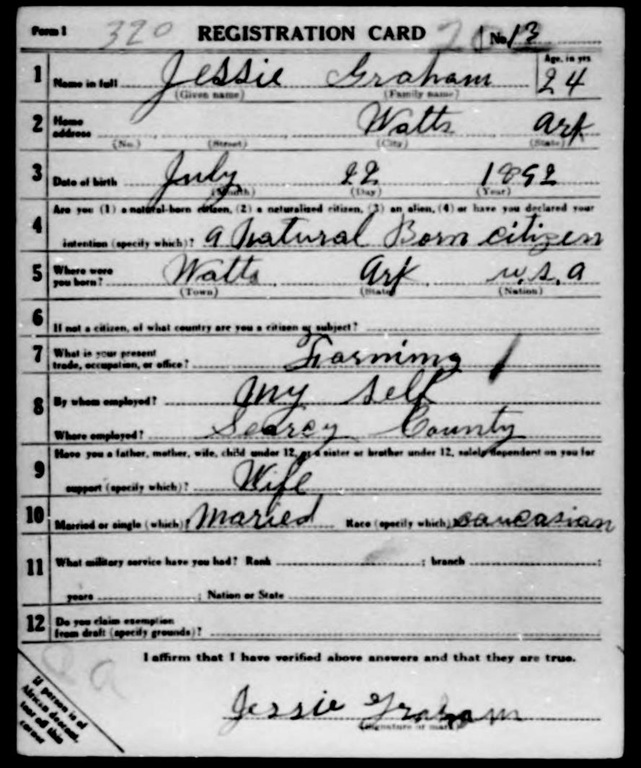 His draft registration card recorded his name signed as Jessie Graham, age 24, a married farmer living in Watts, Arkansas. He was tall, with a slender build, light blue eyes and black hair. One year after their marriage, on 11 March 1918, their daughter Ruby Duell Graham was born. Their son Albert John Graham was born on 19 January 1920. Or was he? That date of birth came from the Social Security Death Index, but the 1920 census was enumerated in Red River Township one week after, on 27 and 28 January 1920. If that is the correct birth date for Albert, he should have been recorded on the 1920 census, but he was not. Albert first appears on the 1930 census, enumerated on 12 July 1930, where his age was recorded as 10. So, 1920 seems to be the right year for his birth, but either the date recorded by the SSDI is off or the census enumerator overlooked Albert! The 1930 census recorded another son, Alvin Jesse Graham, born on 20 August 1925. Alpha Graham, a son and their final child, was born circa 1935. On 27 April 1942, Jessie registered for the World War II draft in Marshall, Arkansas. 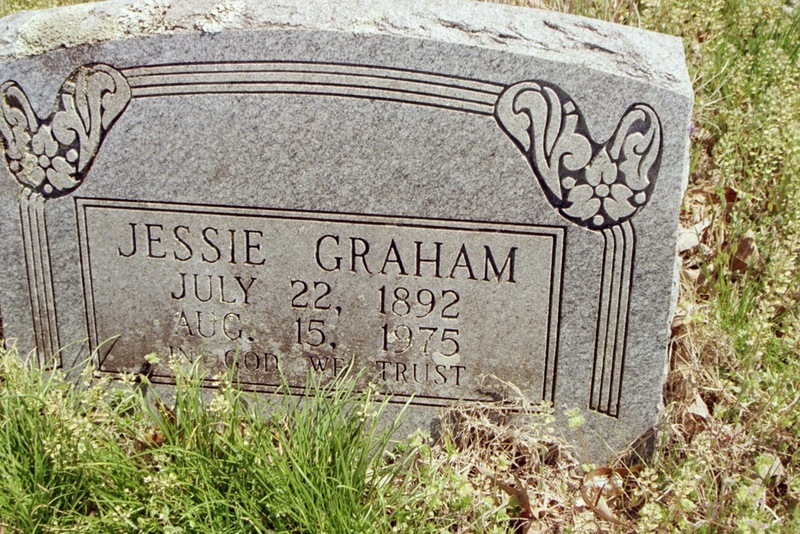 This time his name was recorded as Jesse C Graham, age 50, still a married farmer living in Watts, Arkansas. His height was 5’10”, weight 200 pounds, eyes blue, hair brown, and complexion light. Callie was listed as the “person who will always know [his] address”. He signed the card “J.C. Graham”. Callie died on 27 September 1958 at the age of 64 and was interred at Rambo Cemetery, Searcy County, Arkansas. Jessie died on 15 August 1975 at the age of 83 and was buried beside his wife at Rambo Cemetery. His obituary was published in the Arkansas Gazette on 19 August 1975. The census enumerators recorded these variations of Jessie’s first name: 1900 – “Jessee”; 1910 – “Jessie”; 1920 and 1930 – “Jesse”. The SSDI recorded him as “Jesse”. I have two examples of Jessie signing his own name, first as "Jesse" on his brother John’s marriage bond, and second as "Jessie" on on his Word War I draft registration card. His name was spelled "Jessie" in his obituary and on his tombstone. I have recorded him as "Jessie Cornelius Graham" in my tree. I’ve seen one instance of Callie being called California Watts in a member family tree at Ancestry. Some family trees have spelled Ruby’s middle name as Dewell. What was the middle name for Minnie B? Why wasn’t Albert recorded on the 1920 census? Is his recorded birth date incorrect? Did Jessie ever actually serve in the military? Ancestry.com: United States Federal Census of 1900, 1910, 1920, and 1930; Social Security Death Index; World War I Draft Registration Cards, 1917-1918; U.S. World War II Draft Registration Cards, 1942. Find A Grave: Memorial 42275262 and Memorial 42275261. Tombstone photographed by me on 10 April 2010 at Rambo Cemetery, Searcy County, Arkansas. Personal correspondence with Michael Graham, Jessie’s grandson, December 2010. Shirley, thanks for responding. I haven’t yet made any connections between my Grahams and yours, but it’s possible there may be some. I do know that some of my Graham and Watts ancestors moved to Oklahoma. Keep reading the blog, maybe a connection will reveal itself!